As described, “clicker” games sound painfully mundane. They’re designed to be played by doing nothing more than tapping your phone or tablet screen, and there’s little complexity or variety to the interactions, just constant finger-battering… and then results. Boring, right? Surprisingly, some games have figured out how to build fun experiences around that action. I don’t actually know why we’re pummeling these slugs, but it sure is amusing. I thought that clickers made the most sense on Apple Watch, where you could play for a minute and do nothing more than tap a tiny display. Runeblade is pretty fun and Cosmos Rings is the best thing I’ve played on a smartwatch, but here comes Best Fiends Forever to convince me that a clicker on your phone can actually be pretty sweet. This is compulsive gaming packaged with serious polish, and I can’t stop checking in to see how the battle is progressing. But is that simple fun just a gateway to spending big? Even after hours spent playing the game, it still feels like I’m actually doing very little in Best Fiends Forever—and yet there’s a constant sense of progression and accomplishment. You’ll start each game with a single, colorful creature and your very own fingers. As cartoonish slugs pop into view, you’ll smack them around a bit until they disappear and then reap the coins that spill out… and then repeat that action across hundreds of areas, slaying thousands of slugs. Tired of slower progress? Hit the portal and start over with some accumulated boosts. Each new area brings tougher slugs and boss showdowns, but you’ll also rescue new allies and expand your army of adorable beasts. 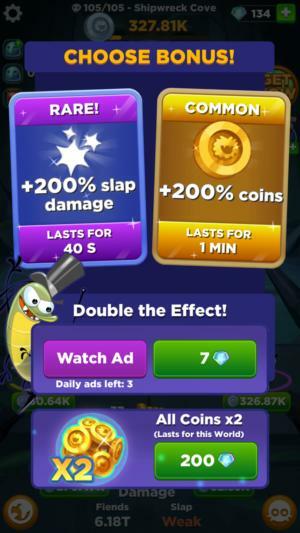 Better yet, all of those coins you snag can be used to upgrade their power and abilities, as well as the strength of your own taps, allowing you to smash through them with ease. Granted, the back-and-forth never ends: you might feel more powerful through the next few areas, but then the slugs get stronger and stronger. As such, it takes longer and longer to push ahead, and the game feels much slower as a result. Is this the part where you open up your wallet and start pouring heaps of cash into Best Fiends Forever? You could, but there’s a better solution: start over. Yes, really! 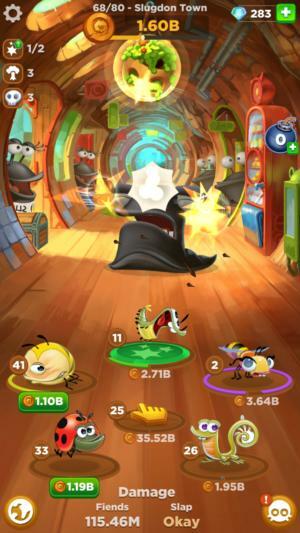 Best Fiends Forever has this interesting, cyclical approach where at any time you can dial back to the very first stage and re-abandon all of your best fiends and their upgrades, too. What’s the point? Well, while you lose all of that core progress, you also earn a heap of Boom Stones that can be used to equip and upgrade permanent souvenirs, which can bring huge boosts to your squad—like multiplying your total attack power by 3,000 percent and more, or netting several times more coins in each battle. Free coins! All you have to do is... stop playing the game? And since your team will be so hyper-powered by those souvenirs, you can zip through those past areas in a fraction of the time it took before. A slug that took five seconds to beat before could be vanquished with a tap, and you might get through an entire world in less than a minute. Backtracking is rarely fun in games, but here it’s a key part of the journey: you’ll earn enough extra power from the return trip that you can push farther ahead into new terrain… and then do it all over again to get even stronger. Best Friends Forever seems to function well as a money-making machine, but what’s surprising is just how far you can get with a little patience. Entering the portal and tolerating the return visits to those past areas is one example, but another is just how much not playing the game factors into the experience. It’s not only a good idea, but it’s also rewarded—strongly! 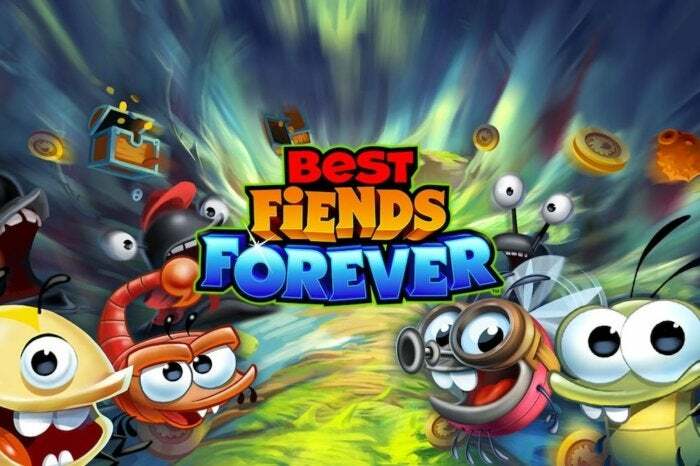 When you step away from Best Fiends Forever, the adventure continues on. Your fiends keep battling and earning coins, and since they never get hurt or perish, there’s really no penalty for ignoring the game for hours or days. 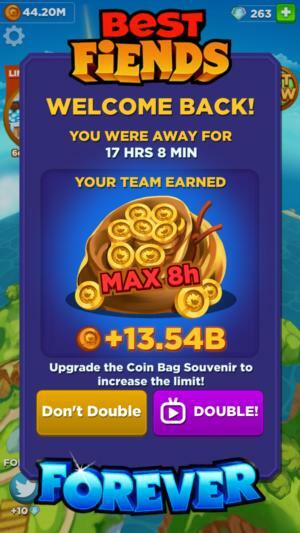 When you get back, you’ll have that big stack of free coins available to spend on upgrades, which, for example, might make the difference in defeating whichever boss might have stymied you the last time you played. You might also find a power-up waiting for you on the screen, and if it’s been a few hours, you can also get some free coins or premium diamonds. There are so many freebies. Can’t wait? You can spend money on perks. And yet there are also opportunities to spend big, if you choose. 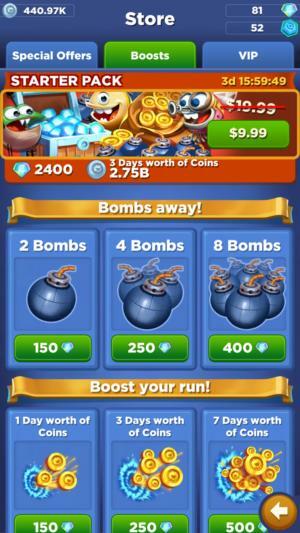 Diamonds are used to buy coin and damage boosts, as well as bombs that can help you finish off tough bosses, and those are sold in bundles ranging from $2 (150 diamonds) to $80 (11,000 diamonds). Best Fiends Forever also offers discounted perk packs, with a $10 starter pack available during your first week of play that gives you 2,400 diamonds and “three days’ worth of coins” based on your current progress in the game. There’s one more option, and it’s a bit shocking: a VIP monthly subscription plan. For $15 a month, you’ll gain a special souvenir that automatically doubles your damage and coins, as well as exclusive iMessage stickers and a discount on all other currency purchases in the store. And your Facebook friends get a 10 percent coin boost, as well, just for knowing you. Again, that’s $15 per month to sustain those benefits, but it doesn’t seem like enough for anyone other than the largest-spending whales. Unless you intend to invest a lot more money into Best Fiends Forever besides that monthly fee, I just don’t see it adding up. In my case, I dropped the $10 on the starter pack to get those 2,400 gems, and then spent a chunk of those on permanent boosts to double my coins and damage. Just like that, with my one-time purchase, I equaled the VIP subscription’s biggest perk. Sure, you can stack those benefits for even greater advantages, but that kind of aggressive boosting seems strictly for the die-hards. Doubling power-up effects and coin hauls by watching video ads is a free, easy way to make the most of your play. Whether or not you plan to spend money on single purchases or a subscription, there’s one freemium element that can be worth everyone’s while: watching the optional video ads. When you return to Best Fiends Forever after several hours away, you can watch a 15-30 second mobile game commercial and immediately double your coin haul. That’s totally worth it. Likewise, when you receive a power-up before facing a tough boss, you can watch a video to double its effectiveness—also potentially worth it. Watching a few ads now can save you a lot of waiting later for resources and boosts. It’s easy to see how someone could fall into a deep hole of spending with Best Fiends Forever. The rapid pace of its progression can be intoxicating, and that makes you want to keep checking back to see how many coins you’ve earned, or how much farther you can go. But then it slows down significantly, and if you’re not patient enough to wait for coins or boosts and let the game’s natural pace run its course, then you could spend a lot of money chasing that thrill. 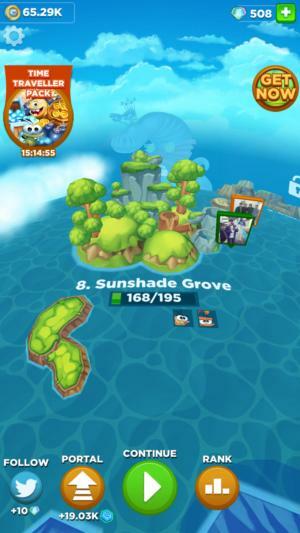 But that’s true of most freemium games, and to its credit, Best Fiends Forever really does seem geared to point you towards making steady gains instead of spending for shortcuts. Dropping that $10 on a starter pack did provide a nice, ongoing boost, but I’m hooked enough to believe that steady play would have kept me going strong without paying anything out of pocket. Best Fiends Forever might be dead simple in design, but it’s still one of the most gripping games I’ve played on my phone all year.